This isn't going to be the same as it would be on P3, but it's pretty darn good if you're wanting tacos on P2. Spices of your choice, like cumin, chili powder, cilantro, etc. Brown ground beef with onion, and add garlic toward the end. Add taco spices of your choice to taste. 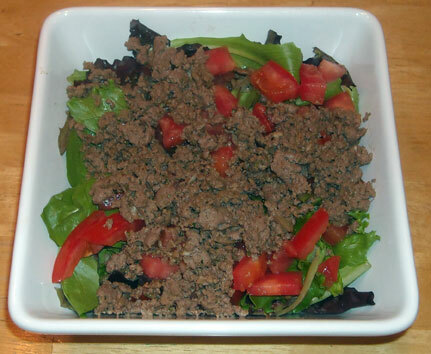 Serve over lettuce with diced tomato. This reminds me of san choy bao which is a Chinese dish. For a different twist, you can try having lettuce leaves and filling them up by yourself with the filling... sort of like a make your own dumpling/sandwich, except with lettuce! i am looking into starting the HCG diet. I thought all meat had to be boiled or grilled? Hi! Really? I haven't read that but I went strictly by the Simeons protocol so that could be part of someone else's book somewhere. I brown meat all the time and just drain any fat and it's worked great for me. Yeah. I don't boil meat, ever. I do like grilled meat (steak, chicken, burger) but you can saute in water (just don't add oil) or bake, too! thanks so much. I can't wait to try your recipes! 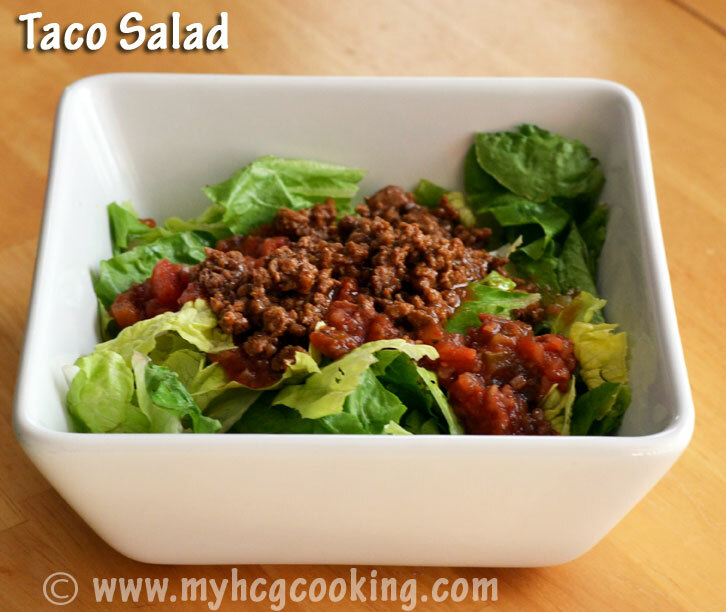 Your recipes have saved my HCG life. I lost 20lbs on this diet, mostly from using your P2 recipes! I'm about to start phase 3, and plan to use alot of the delicious-looking recipes you have on here. I just have one question... in P3, I feel like I have to calorie count ALOT. Is there an easy way to do this without it taking up so much time? Congratulations to you! That is a fantastic accomplishment! where did u buy your hcg? So glad you liked it! Sonya the site I got mine from no longer sells it, so I don't have a recommendation for you. Sorry! 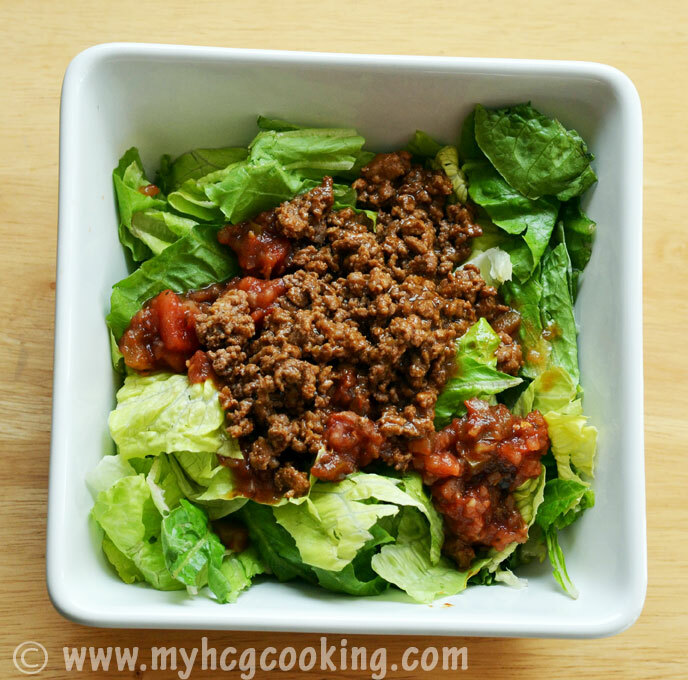 Can we eat ground turkey? I have 99% fat free ground turkey.. I'm trying while doing R1P2 to cut out all red meat. I get mine at www.myhcgsupplies.com for real Rx HCG Injection kits that come with everything. Having 2 vegetables seems to contradict the protocol. ??? Do you mean lettuce and tomato? I count tomato as a veggie or a fruit, depending on what I want. I've always been more flexible with the "rules" though and it works fine for me. Always be cautious at first when bending rules, of course. Just finished making this wonderful salad. The flavour was great and I felt very full after. Thanks for all the wonderful recipes on your blog. I was wondering about the tomato. But that does make since that it could possibly be couted as a fruit. I have had many days where I have fallen asleep before eating my second serving of fruit...or just plain forgot. This would be a good way to to avoid those instances. thanks! Love this recipe. I plan to try meatballs, spaghetti and meatloaf this week. You are saving my diet. I am so very tired of asparagus and spinach. I was curious if anyone else had tried zucchini on phase 2, since I love zucchini. Thanks for this site. So glad it's been helpful for you! I did eat zucchini on P2 and did great with it, and I know others who have as well. :) The spaghetti recipes here with zucchini noodles are some of the most popular! My HCG documentation says I can eat 4-6 oz of Protein. Should I really try to stick to 3.5oz? All of the recipes on this blog follow the Simeons protocol which allows 100g protein twice per day. Your documentation may be different so you'll have to decide what to do based on your own situation. Thank you for your recipes. I am excited to do this protocol once again. The first time I did it I was working in a bank with lots of friends who brought "goodies". Now I am on a mail route where I won't be tempted. I am excited to try some of your recipes as I will be doing the 800 calories protocol instead of 500 calories. I got to Rebekah's Pure Living to get my HCG drops. She has kits also. I am doing a "Candida Cleanse" before I start my HCG to help with weight loss. Thanks and I look fwd to using your recipes. Online www.nuimage.com pharmaceutical grade through doctor screening online. Iv'e been doing the HCG diet for 14 days now and lost 10 lbs. I love it and it's so healthy. I never boil my meat I either bake or grill. You can sautéed with a little water. I have had zucchini zoodles several times. No issues. also use miracle noodles.